Assuming the role of one of the greatest sorcerers of the time, you will be participating in the legendary tournament of the 12 Seasons. Your goal is to raise the most victory points by gathering energy, summoning familiars and magic items. If you amass enough crystals and symbols of prestige, you will become the kingdom’s most illustrious mage. Optimize the cards through skilful combinations, using the seasons wisely to access the energies of crystals and become the the new Archmage of the kingdom of Xidit. Tons of different strategies of game play. Mix cards to create unique combinations to give you more chances to win. Manage your energy between seasons and adapt your game play. 3 different difficulty levels in one game! There are a few sheets of cardboard to punch when you first open the box, claiming 10 of your precious minutes as their own. Outside of that, you’re only restricted by the rulebook. And it is very easy to read – probably the cleanest and most useful that I’ve been exposed to. All told, you’ll be playing within 30 minutes of opening the box. Set-up is quite easy, as the dice and deck of cards are the most cumbersome accessories… which is to say there is nothing cumbersome about Seasons. Games take between 45 minutes (2-player) and an hour and a half (4-player). Seasons isn’t a game to be mastered in five go-rounds. It takes time to learn the nuances of the power cards; time to understand the flow of the game to correctly place stockpiles of cards for later in the game; and most importantly, time to figure out powerful card combinations, which become the key to beating experienced players. Even 20 games in, I am so far from “mastering” the game that I’m only certain to beat complete newbies. As for teaching those newbies: I find Seasons to be that strangest of beast where newcomers are just as well off learning from the rulebook as they are from an experienced player. I can train somebody effectively, but it’s going to take the exact same 20-25 minutes the rulebook will take, and that player will be equally prepared for their first game. I don’t consider Seasons to be light fare, meaning this isn’t a game I would throw out in a room full of people with no interest in board games. It’s not too complicated for them, but requires sophistication to appreciate. I would simply be wasting their time, and I don’t enjoy playing games with people who aren’t invested… but when you’re with a fellow gamer this is a lot of fun. It’s just as brisk and engaging a 2-player game as it is a 4-player game. Within that very small, designer-induced range, the game scales perfectly. Better to play with one locked-in player than coercing 3 reluctant souls. Seasons is PG-rated fantasy. There are cute and not-so-cute creatures and objects to summon, but nothing that treads anywhere close to violence, nothing that will make a child scared of what’s under the bed. That said, I can’t see a child having any fun with this game. The illustrations on the cards are akin to the animations they’ll love, but the game is geared toward thinking and planning with minimal action. I would introduce this to a pre-teen who already likes board games. Thematically there are many similar games – anything that revolves around a wizard-type earning prestige or glory through the creatures they summon, such as Summoner Wars, will feel the same. But there is nothing like Seasons’ game play. The interplay of dice, cards and tokens is seamless and novel. If you’re like me and appreciate a fresh and creative new game mechanic, Seasons is an absolute must-own. The dice are indescribable… you have to hold them in your hands to fully appreciate them. While games like Quarriors package flawed dice in order to make the price more reasonable, the publishers of Seasons spared no expense in making them flawless. But most importantly, the game is fun… without that, all the original mechanics and custom dice in the world couldn’t save it. Seasons is a game I’ll be playing every week or two for years to come. I am a sucker for beautiful artworks. 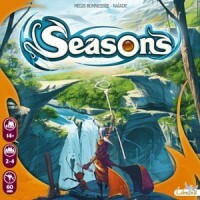 And Seasons is a board game (mostly cards though) with very beautiful artworks. There are games that have beautiful artwork but fails in it’s game play (Anima comes into mind). Unlike Anima; Seasons’ game play lives up to its’ artwork. Like every deck building games (Dominion for example), every player in Seasons aims to score the highest crystal points (victory points) in order to win the game. You accumulate these crystal points via cards you can summon out with energy tokens (in MTG it’s called Mana). The game begins with card drafting and at the end of the draft, each player will have 9 cards. From there players separate the 9 cards into 3 years. Each year having 3 cards. The player holds the first 3 cards in year 1, while the year 2 and year 3 cards are placed on the table. The year 2 and year 3 cards is added into the players hands as the new year approaches. At the beginning of every round, a player rolls a set of dice to determine actions that is being taken on each and every player’s turn. Unlike Magic, where the player starts his turn by drawing a card, Seasons added more randomness to the flow of actions with dice rolls. At the beginning of the turn, you can transmute your energy tokens to crystal points, or increase your summoning gauge (so that you can summon more cards into play), increase crystal points, gain energy token or draw cards. Players are forced to adapt their game play in accordance to dice rolls and other player’s decision. And as dices are rolled, the seasons changes and the new year dawns. At the end of year 3, the game ends and the victory points of each player is calculated. The player with the highest crystal points wins. Well generally that is how the game is played. Now onto pro and cons of the game. 2) The game is divided into 2 decks, beginner and advance. You will usually learn the game with the beginner deck. These also means the replay value is high. 3) Rule book is helpful as it explains each cards and its effect. 4) Enable players to play elaborate combos to score crystals. 5) Easy to play once you get over the learning curve. 1) The game LOOKS very complicated. 2) You are sometimes at the mercy of the dice. 4) Need to know the cards well in order to play well (duh). This is the new favourite game in my house! It’s a terrifically well designed game that borrows from other games but still manages to come across as fresh. The concept is you’re wizards competing in a “Most Luxurious Beard” competition. Something like that. Well, you’re wizards at any rate. The why isn’t as important as the how. To start off with you choose the 9 cards you’ll be playing with by drafting your hand. It’s fun seeing what cards your opponent is choosing, and fun to see which card they’re clearly avoiding so you can make sure to leave it for them. You then divide your cards into 3 piles (1 for every “year” of the game) and start off with just the first pile in your hand. Then you get to roll ENORMOUS dice. They’re huge. Definitely not a choking hazard unless you have some sort of Kaiju baby roaming your house (in which case you have other things to worry about than the size of dice, like how do you change that beast without being killed?). The dice let you pick up energy tokens (which you need to play cards), advance your summoning track (which dictates how many cards you can have laid out in your tableau), exchange energy tokens for points, draw new cards and advance the game time through the 3 years of play. Plus you get to roll different dice for each season of the year. So, yeah. Lots of big fun dice! The learning curve isn’t too steep, but once you get to know the cards and the best way to play them the game really opens up. You can play as many cards (some of which have instant effects, others can be used throughout the game) each turn that you can pay for and have space to play. The energy tokens that let you play cards can also be “transmuted” into crystals (points) with a different exchange rate depending on what season you are in. There is nothing more sweet than using your cards to maximize the number of tokens you have and then converting them all into sweet, sweet crystals. I thought having such a limited number of cards to play would be a draw back, but it really makes you think about the way to maximize their effects. My only quibble is that the scoring track is deranged and easy to knock your marker cube off of it. We switched to using actual (probably fake) crystals to keep score, which really adds to the feeling that you’re scheming wizards. My other quibble is that this game drove me to make my own dice rolling tray, which means I’ve really fallen down the rabbit hole with my board game obsession. Board Game Arena has an excellent online version if you want to try it out before you buy. Seasons is a game that I always feel like I should like more than I actually do when I play. This might come down to me not being very good at it, something my BoardGameArena Track record would seem to suggest. Anyways on to the review. Firstly no review of Seasons can get away without noting that this game is just beautiful. The colours, the quirky characters, the beautiful illustrations and most of all those gorgeous chunky die covered in iconography that just begs you to play. The game is definitely visual and tactile treat. Somewhat at odds with the beauty of this game is how absolutely tacked on the theme is. In theory you are dueling wizards summoning spells and familiars from the elements of Earth, Air, Wind and Fire and transmuting these same elements into power crystals that are necessary for you to win the title of wizardiest wizard, and that all sounds awesome. However in reality it always seems that you are just rolling die and collecting tokens and playing cards and all of the magical stuff kinda just falls away. Now I mention this because I that for some people theme is super important, and this game just has no theme. So now to the gameplay. I’m not going to outline all the nitty gritties because that information is available other places, I’ll just try and give a fairly succint overview and how I think these elements are implemented. So the game starts with some card drafting, this is super important because it mitigates the fact that some card combos are super overpowered. This does of course put new players at a significant disadvantage over experienced players. However the designer knew this in advance and there are actually four starter decks recommended for beginners and I always use those when playing with someone new to games in general and often if I’m playing with someone new to Seasons in specific. That said this game is much better with experienced players. Once you have your cards you choose the order (year) in which they will become available the game begins. Each turn you roll the colour die corresponding to the Season and then each player chooses one and takes that action. This of course allows first player to take the best die, however you always roll one more than the number of players so everyone always chooses between at least 2 and the last player gets the bonus of controlling the speed at which the game is going. I like this smart bit of game design quite a bit and it really works well in 2-player where both players are gaining asymmetrical advantages based on turn-order. The cards do all sorts of things and are broadly sorted into one off’s that give you a one time windfall of energy tokens or the power crystals needed to win the game. The more powerful ones remain active and allow you to set up an engine supplying you with a constant source of elements and crystals. This is really where the meat of the game is, and at it’s most satisfying you can quickly build this efficient engine where every time the season changes you are stealing your opponents crystals or taking your expended one off’s back into your hand so you can devilishly play them again. However this strength, the fun of constantly triggering effects, is the book management that is therefore involved. The creators of this game did nothing to make this any easier. Actually the stupid crystal scoring board is so fiddly I’d almost say they made it harder. Now this may not be a negative for you, but it sure is for me. I feel like it just disrupts the flow for every time anything progresses, a season or year, I’m reading all my cards and figuring out that I get this but I have to give you that and then we both have to give Alice this other thing. It’s just not that smooth. A category firmly in this games favor is its replay value. The base game comes with tons of cards. So many cards that they suggest you start out only using the first 30 and then add in the other 50 later on. There are also expansions that give even more cards (and some new mechanics I’ve heard, but I do not have them). So one thing that isn’t a problem with Seasons is you solving it, and even if you do figure out some crazy card combo the drafting mechanism at the beginning means someone else will stop you from using it every game. Overall my view is that the game has plenty of depth and fun and interesting combo’s to explore and so many cards with so many abilities. Are you in last place? Use the Boots of Time to buy more time by moving the clock back. Does someone else have a perfect engine? Play a card that makes them return one of their cards to their hand. This game is rife with possibility and every time I think about it I want to just get it out on the table and play. The problem is, I don’t always feel that same excitement after playing. A final note: This game is hands down the best with 2 players. I find it the increased length added by more people bogs the game down and makes it’s fun:time ratio less satisfying. Yes you do. That’s why you’ll like this game. You just can’t help it. Players are wizards who compete in a grand tournament. The game moves through a calendar counting months and changing seasons (doh!) The player with the most points in the end of the third year is the winner! Points are scored in a few ways – all the cards stay in front of you on the table and give you points at the end of the game. Also, there is a huge Crystal track which provides you points. The game involves three main elements – deckbuilding (drafting), throwing dice and playing cards. In the start of the game players draft cards until everybody has a deck of 9 cards. Than players split those 9 cards in 3 smaller 3-card decks. A three card deck? Really? Well, it actually works quite well. After the decks are built players roll dice – different set for every season. The dice tell you what actions you can take. That includes genereting mana, changing mana for Crystals (these are different resource for playing cards + they bring points in the end of the game), drawing new cards, etc. I thought that dice telling you what cards you can play would be terrible, but it is not at all! It does work and is really fun. You can’t play all your cards the first turns and the seasons change rapidly, so this part of the game is quite dynamic and interesting. The rules are intuitive, simple and though at first some aspects seem weird, they really work beautifully. Here’s my problem with the game – it pretty much doesn’t have any! This really really disappointed me. It feels like a lost opportunity. Here in my gaming group we are all very aggresive and ‘in your face’ gamers. We love games that let us screw with one another and interract in interesting ways. Well, there’s none of this in Seasons. One little exception are cards like “make everybody draw a card” or “everybody returns one card he played to his or her hand” and one big exception is the dice selection – one player choses a die and keeps it leaving less choice to the next and even lesser choice to the next players. But that’s pretty much it. Gods, the ART! This truly is a box of candy. You’ve got this amazing huge colorful dice, nice looking player bords and callendar and the art on the cards is superb. This is easilly one of the best looking cards I’ve ever seen. The strongest part of the game, at least for me! The game comes with 100 cards, and only 30 of them are recommended for beginner games. Keeping in mind that every game players use 9 + the ones they draw (which are not too many) the combinations should be fresh game after game after game. No worries at all! This board game is a box of candy. I just can’t hate it. The art is great. The mechanics are great. The rules are refined. The components are amazing. However, it has little to no player interraction. I really don’t like this at all. But I can really forgive that. Love the game and can recommend it for the art alone. However, if you wanna poke your friends – like I love to do – this is not your game. Cool artworks, no doubt! But how about the game play? Now to explain that sentence. This game is abstract, so nothing to explain here. But if you take it as it is, it’s kinda fun and interesting with amazing arts. In the game you will have to transmute energy to gain crystals (points). There are 4 different kind of energy in the game based on the 4 seasons in a year. Players will play 3 years, which means 12 seasons. In each year, players will draft cards and then roll the season dice (each season). Starting from the first players, they will choose a die and gain it’s effect. Then players will play a card from their hands. Dice give either crystals, energy, cards and transmutation action. Playing cards cost you energies and some of them give you benefit, either instantly, one time, by activation or passive ability that can help players to gain profit or disrupt their opponents. By combining the die, cards, energies they have and even crystals, they will try to get more than they spent. When the game ends, player with the most crystals wins the game. The components and the arts are spectacular, amazing visuals and presentations. Wait till you see the season dice with your own eyes and get the feel of them in your own hands, those chunky dice are fun to hold and roll. The game play is really simple but learning and mastering the combos are the real fun this game can offer. The cards have moderate text which for first / new players this would seem overwhelming (but in one play this would change significantly better). After knowing the cards’ abilities and possibilities, you will learn more and more how to play the game. The draft phase is essential, because this phase practically seals player’s fate during the game (unless mis/fortune interferes). This might take quite some time, but once it’s done, players should already come up with some plans. The rest is how they adapt to the dice roll and players’ actions. So make sure to draft good hands and play them out correctly and efficiently but don’t forget to have a backup plan. Back in the day, I’ve played it quite often and it’s kinda a hit among our groups. I like this better than Lords of Xidit (another game with the same universe and theme, but different genre, programming). Ah, Seasons. What a balm to the senses you are. Games have become more involved and more complex as a rule, and while there are simple games out there, the complex games have also, by necessity, become more complex in their explanations of the rules. This is not a bad thing overall; long explanations are better than no explanations. But many of the games that are out there that are considered to be fun to play, also suffer from instruction booklets that fail to explain everything accurately. Enter Seasons, a game that learns from its predecessors. Seasons is not an overly complex game, but it does feature cards with different effects, and as a gamer who likes card games, I can say that cards have the most problems with keeping rules straight and concise. But Seasons has taken this into account, and has a detailed accounting of how the cards are supposed to work, even with unusual situations such as if there are duplicates of a card in play. I cannot express how refreshing this is; if you have questions about a card, you can look it up in the manual and get your answers in plain black and white. The game itself is a mixture of card drafting, dice rolling, resource management, and general shenanigans. The object of the game is to collect crystals, which count as victory points; as most games these days are, you win the game if you have the most victory points at the end of the game. There are a variety of ways in which you can get crystals; some power cards that you play can earn you crystals, you can transmute energy to get crystals (you get more for certain energy types depending upon what season of the year you’re in), and you can get crystals from the die rolls at times. In addition, power cards that you play will have a point value associated with them that counts towards victory points at the end of the game. The game has one board, and it has only three real functions: It keeps track of the year you’re in (there are three years in all), it keeps track of the months (3 months per season, 4 seasons total), and it tells you the conversion rate of energy to crystals when you perform a transmute action. During every season, one energy type will be worth 3 crystals when transmuted, one energy type will be worth 2 crystals, and the other two energy types will be worth one crystal. You gotta love it, plain and simple. During the start of the game, a collection of cards will be arranged to draft from, a set of cards for each player in the game. Each player selects a card from the initial pile they choose, then transfers the rest of the cards to the next player in the cue. In this way, everyone gets access to the cards, and this continues until everyone has drafted all the cards. Among the cards that the players draft, they will need to separate the cards into groups that they will use for the different years; three cards for the first year, three cards for the second, and three cards for the third. Players can look at the set cards at any time, but they won’t be able to use the cards until they come to the year in which those cards are set, in which case they are added to that player’s hand (prior cards from the previous year are kept if they are not used). Each power card falls into two categories: familiars and magic items. Familiars are characters that can perform a useful and often powerful effect, and magic items are items that can perform a variety of functions. Some power cards have effects that are enhanced by magic items, and some have effects that work for familiars, so the distinction is there, but they function the same in general. Each power card has a cost to cast, and can be as little as nothing (Temporal Boots) or can require lots of energies of different types to cast. There are four energy types: Wind, Water, Earth, and Fire, and they can be gained from dice rolls and power cards. Each player has a personal tracker board to keep track of their current energy reserves and their current summoning skill. The summoning skill is a number that goes from 0 to 15; what it represents is the number of power cards you can have in play at any one time. This can be increased by die rolls or by playing certain power cards. There are also seven slots on the board for you to store the energy you collect; unless you play a power card that allows you to store more, seven is the maximum amount of energy you can have. It also shows special abilities that you can activate, but to do so means you will take a score penalty at the end of the game. There are four special abilities and all, and you can activate any of those four abilities a maximum of three times per game. You can use one ability three times, or three abilities once each, or even just use one ability once and leave it at that. Of the abilities, one will allow you to swap two energy tokens for any other two energy tokens, one will allow you to increase your transmutation, one will allow you to increase your summoning rank by one, and one will allow you to draw an extra power card if a power card symbol is rolled. Now, let’s talk about the dice and how they are used. Each season has colored dice that correspond to that season. On those dice, there are symbols: There is a power card symbol, a number (represents the number of crystals you collect), a star (raises summoning level), elemental symbols (feather for air, flame for fire, raindrop for water, and leaf for earth), a border symbol (if rolled, the player can perform a transmutation), and dot symbols (1 to 3 dots, representing how many months will pass). These symbols are mixed together in various combinations on the dice, and some symbols are more common in differing seasons than others. Each player rolls the dice when their turn comes up, but every player performs their actions during any player’s turn. The player who is rolling the dice for that turn will be the first to collect a die to use for that turn, then the next player will collect a die, and so on, until only one die is remaining from the roll. The last die that remains will determine how many months pass in time, according to the dot symbols on the die. The first player resolves their die first, collecting whatever symbols are on the die and adjusting their crystal and summoning level accordingly if necessary. Then they can play power cards if they meet the energy requirements and have the summoning level to do so. If the die roll the player collected has a border symbol around the die face, they can performs a transmutation to exchange energy for crystals. After the player is finished with this, the next player can resolve their die, and so on and so forth, until all the players have resolved. Then control switches to the next player, and they then roll the appropriate dice for the current season. In this way, the game progresses until the end of the game is reached after the third year, and all of the crystals and power card values are tallied together, along with any penalties any players have suffered for using special abilities during the game. There are some power cards that can affect the end of the game based on specific values; these will have to be accounted for as well if the conditions are met. In addition, power cards that have not been played at the end of the game count against the player that holds them, so it is best to have an empty hand at the end of a game. I have to say that I really enjoyed the game right from the start. Though the game may appear to be complicated, it flows very nicely, and turns progress very quickly in comparison to some other games. As I stated at the beginning, the rulebook is a BIG help, and easy to read as well. About the only thing that I don’t particularly like (but it may be by design) is that power cards can be difficult to acquire; since they are based on a die roll, and only one face of a die has that symbol, it is up to pure luck whether you get the opportunity to draw one. In the beginning of the game, it can be difficult to play power cards, since you need to build up your summoning level first. Later in the game, you will likely have plenty of summoning levels, but not have the cards to utilize it. Even that, though, doesn’t hurt the game itself; there are quite a few cards that allow you to put other power cards into your hand or into play, so there is almost always something you can do. I really hope other game developers take notice of Seasons and take notes, as the developers of Seasons took the time to make sure that the players of the game had as easy of a time of playing the game as possible. Picking up the game, I was able to jump into this one with no problem at all, and the questions I had were easily answered. Aside from the fun of playing the game itself (which was considerable), this made a really good impression on me. That was my wifes reaction to her birthsday gift after reading what was on the bottom of the box. Not the reaction I was hoping for, I can assure you. Needles to say she is not into fantasy settings. I was thinking maybe after she opens it and see lovely, lovely artwork and big, chunky custom dice she will be more enthusiastic, because the production value is really great and the game just looks beautiful. She was not as glamoured as I expected. It was looking bad at this moment. But my wife tried enough of games to give it a try. So does the story have a happy end? Did she liked it at all? **** yeah! She did and like is not even the proper way to say it. We played it 5 times in the next 5 days which is far more boardgaming that we were used to lately (those who have two small sick children know what I’m talking about) That just says a number of things right away. First – it is fast game, easy to set up (as long as you treat drafting as a part of game not a set up) You can easily finish a two player game in half an hour to 45 min. Second – 2 players. It really works with two, so this is a great game for couples. Third – Easy to teach, but still leaves you with a lot of choices during the game. Cards is where the fun of this game lies, not rolling dice… well ok, rolling big dice is fun too. Fourth – it is fun. This light almost euro-like game, but with lots of dice rolling and special abilities just hits the spot. You feel just right when you finish it. Your brain does not hurt after it and at the same time you don’t feel like you played a filler but a crunchy little game. And artwork – it is indeed lovely. I’ve asked my wife how she would rate it? She said 10 out of 10. It ended up as one of her favourites alongside Ticket To Ride, jumping over the ones like Dixit, Agricola, Airlines Europe. Now that is what you call a turnaround. Players are the mages of Xidit come together to show off their powers to become the archmage. Each turn the starting player rolls special dice to determine what energies are available for the wizards to craft their items. The Dice are specific to each season and have more or less energy symbols depending on the season. The dice energies have one or two winter, spring, summer, or fall and sometimes one of two different seasons. In addition the dice may indicate that the player can play more power cards, gain a power card, gains crystals, or can transmute energy into crystals. The power cards build the mages’ capabilities. Some powers are simple, use two winter energy to get 20 crystals. Some powers rely on the opponent’s resources, spend two autumn energy to copy an opponent’s energy pool and add it to your own. Some powers make it easier for the mage, spend one energy of each type and for the rest of the game calling powers takes one less energy. The mages look to play as many power cards as possible as they add to the victory point total in addition to their effects. The game is broken down into three years and each year into 12 months. The turns move faster or slower depending on the power dice remaining from the turns’ roll. There are two copies of fifty different power cards in the game and the rules recommend using only the first 30 for the first few play throughs as the effects of the last 20 are more complicated and interact in with each other more. With so many powers there is a lot of replay-ability. At the end of the third year each player totals played powers and crystals, the mage with the most points wins the title of Archmage. The card board elements of the game are the good standard, gamers have come to expect from Asmodee. 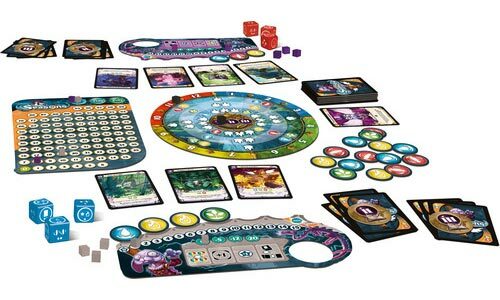 The energy tokens fit into the top of each player board and the symbols all clearly indicate what they are. The dice are much larger than standard size, so aggressive dice rolling should be avoided. The artwork is top notch with interesting details on the player board and the power cards. There are a lot of colors in play because blue, green, yellow, and red are used for the seasons and player colors are orange, grey, brown, and purple. I don’t think the world of Xidit has shown up anywhere else. So this new generic magical world has more exploring to be done in it. Everything that has been presented in this box fits and builds a unique high fantasy world. The flow of time on the circular time board feels smooth and is very well implemented into gameplay. The game turns are fast and building power divided by the mages makes for interesting game choices. This game can cover a wide range of gamers. Those as young as ten can handle Seasons and because of its short play time, under an hour, will work great for families. Seasons also works well for heavier gamers as there are tons of possibilities with 50 different power cards in the game. The game plays 2 to 4 and more players offers more interaction for more interesting gameplay. This game is an accessible and controlled Magic the Gathering. The card drafting during the prelude (initial planning stage) and the mechanic that requires players to stagger access to their cards in sets of three across three “years” (phases) makes for a fun and exciting game each time. These mechanics require you to plan and set up both a short term and long term game strategy. Powerful card combinations are plentiful and always presenting themselves ! Add to all this beautiful components (have you seen the dice?!) and high replay value — plays best with two players but handles up to four. Very thought provoking and strategic and allows you to scratch your MTG itch without the financial commitment or time investment!! Check out other reviews if you want the exacts on play, this is just my thoughts on the game. The first time I played Seasons I came away with a bad taste in my mouth. For one thing, scoring can be VERY fiddly. Every turn someone is gaining, losing, stealing, or exchanging points. (Sometimes all four.) On top of that I really didn’t know how the cards worked off each other. To sum it up, it is an elegant game with nice components, beautiful art, and a good chuck of choices to make to win. One of the people you are playing with needs to be willing to be the “banker” for the score though. Cause if nobody is willing to do that, it’s not going to hit the table very often. To start, just to let people know where I stand, I think this is a really great game. It is not perfect but it is semi-light and very fun. The game starts with a drafting session (wicked fun) and then you get to set up your entire game and how it will play out by setting cards aside for the 3 stages (years) of the game. This takes some real strategy and is easily the most complex the game gets. This drafting and card lay-away will leave first time players feeling completely useless, but as soon as the game hits the second phase (second year) they will understand how bad or good they have done in preparing. As the game plays out, you are rolling dice, collecting power tokens, and trying to play cards. The game revolves around getting these cards out. While there are victory points (crystals) the real power comes from the cards, and in most games I have played the person with the most cards and the most powerful cards wins. Each card has certain things that it can do. Some just give a few victory points, others let you snag power tokens, and more let you mess with opponents. Cards can be a one-time effect, a constant effect, or a use-at-will effect. My first complaint is that none of the cards really feel like power-houses when they get into play. What I mean is that a card might read really well and seem super powerful, but when you play it, it becomes clear that it really has no effect or very minimal effect on the game. My only other complaint is that you can play up to fifteen cards. This seems great, right?! Yeah well keeping track of 15 different effects every few minutes is not hard, but it is boring and tedious. As you progress in the game it gets bogged down by all the different effects each player has on the table and comes to a real pitiful add-one-subtract-one dilemma every time a round ends. It only takes a few games to realize how fast and fun the starting prep and first year are as compared to the middle and end game. Regardless of these two let-downs, this game is still loads of fun. I can recall multiple times thinking to myself how much fun this game is and how much I enjoy playing it. It is a winner and leaves you wanting to play more. There is an expansion coming so hopefully that will help fill the gaps I have found. My Dice Tower secret santa got this for me. I’d never played it before but had heard TDT talking about it a bit and they seemed to like it, so I had added it to my wishlist. Playing as a wizard/mage/magician/whatever is usually a fun theme. I enjoy Magic and this has a variety of similar mechanisms including generating mana and spending mana to summon cards to empower you. To generate mana however, is not something that you have full control over. Here’s another fun theme element – you’re at a three year contest and the game progresses over those three years complete with the, wait for it… seasons. Each season you’re more likely to generate certain types of mana than others. So you roll some dice, pick one dice and you get to do the actions on the dice. There’s a little tension when the dice are rolled and you see the one you really want and hope nobody else picks it before you. But that’s where it felt like the tension ended. Only a few of the cards are aggressive and frequently the aggressive action can have a strong positive benefit for the attacked (return a card to your hand that has a nice ‘when summoned’ benefit for example). I never feel like I’m engaged in a competition with other players when I play this game. I’m just selecting an action, playing some cards in front of me and then it’s someone else’s turn. At the end of the game, you have penalties for cards left in your hand, so no one I’ve played with really tries to be drawing more cards all the time. Maybe that’s what we’re doing wrong, we’re too risk averse. But in the end, there’s little perceived benefit to drawing a card in place of playing a card. In Ticket to Ride, for example, if you’ve already completed all your routes and there’s clearly several turns left in the game, you may as well draw more destinations – but here, if you draw a card and the mana requirements are such that you’re unlikely to to be successful in generating the mana before the end of the game, why take the risk? Anyway, the rules solid, the components are beautiful and the theme is great but I’m not really taken with the gameplay. After playing a couple dozen games it becomes obvious that not all cards in the game are made with the same power level. Which is fine, some cards should support your strategy, my real issue with power level is with a specific card. Thieving Faeries is so ridiculously strong that I would recommend anyone who purchases this game to have them burned in protest. The mechanics to the game are incredibly sound, the concept is awesome. There really needs to be more interaction between players, you basically just do your own thing and aside from making other people draw cards or causing other players to lose victory points, there isn’t much you can do with the cards they play. I would definitely get a few games under your belt at Board Game Arena before buying Seasons. I really didnt have much hope for this game but I was wrong. I love the large dice that change with each season, the cards are very nice in both art and the thickness of them. The game play is easy to learn and there are very few cards that you have a hard time understanding. The advanced cards make the game higher scoring but dont really change the game. I would recommend this game to all types of gamers. Add a Review for "Seasons"